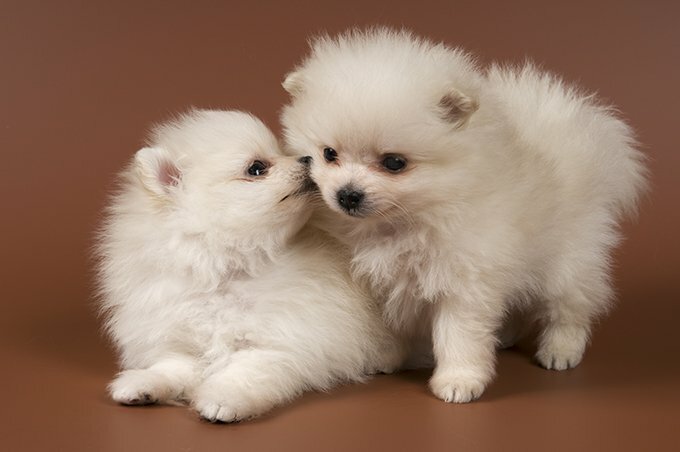 Check out the cute Pomeranian Puppies in the pictures below! Do you want to adopt an adorable Pomeranian puppy? Make sure you read keep reading to find out the facts so you know if a Pom pup is right for your family. It’s fairly obvious as to why the Pomeranian is such a popular pup: they are intelligent, highly social, and downright fluffy and adorable. Thinking about bringing a Pomeranian puppy into your home? Then here are a few things to know about the breed as a puppy! Pomeranians have some of the most amazing, soft coats in the history of dogs. Furthermore, their double coat, which needs regular grooming, can come in over 18 different colors, according to the American Kennel Club. 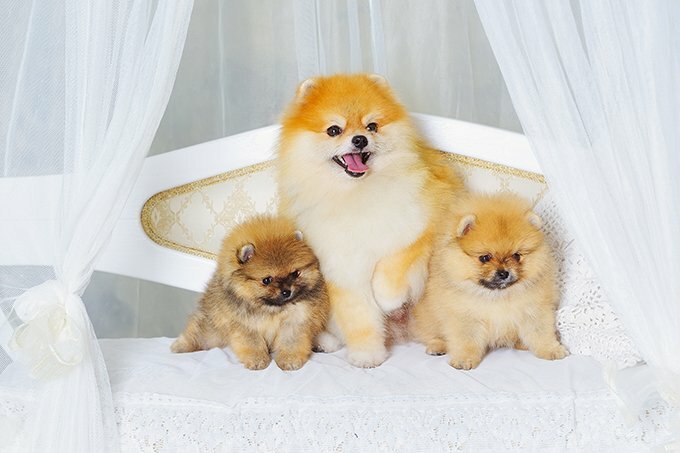 White, black, brown, red, orange, cream, blue, sable, and black and tan are just a few of the color variations your Pomeranian pup can have in their early years. Pomeranian coats are a bit “magical,” though. They can gradually change over time. You may come home with a brown Pomeranian with speckles of tan that turns into a beautiful lighter coat over time. Old school Pomeranians, known as “Throwback” Pomeranians, were nearly all white and around 30 pounds when full grown. These dogs are part of the “Spitz” category, which is a working dog group closely related to wolves. Modern day Pomeranians have this adventuresome, energetic blood still coursing through their veins. Once in a while, a Throwback Pomeranian will be born among a litter of modern Pomeranians with no known explanation as to why! One of the reasons Pomeranian puppies are so wildly popular–aside from their inherent ability to throw anyone into a cute overload–is that they have extroverted, smart personalities. Because of their wit, they may sometimes think that you are not worth listening to, especially if it is about something they don’t want to do. 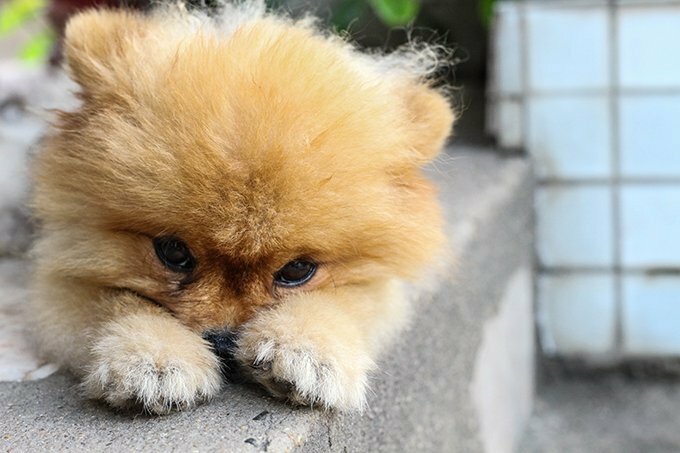 Be sure to set the ground rules with your Pomeranian puppy from the get-go to insure they will listen to the commands they are smart enough to take on. We may have already mentioned how adorable Pomeranian puppies are several times, but it is a point worth reiterating: THEY. ARE. CHARMING. AND. ADORABLE. Pomeranian pups are very alert and may go on watchdog mode if a stranger comes up begging to pet them during their morning walk. Socialize your Pomeranian early on in order to avoid shrill yaps any time a human they don’t know inevitably coos at them. When you bring your young Pomeranian puppy home, you are in for the long haul. Pomeranian pups tend to have a lifespan of roughly 12 to 16 years, sometimes longer. The good news is they will retain their puppy-like happiness, kisses, and playfulness long through their adult years if they are properly socialized and exercised. Remember, you can find just about any breed of dog you are looking for at a shelter or rescue. Look on Facebook for a Pomeranian Rescue groups in your area. Do you have a loving Pomeranian at home? 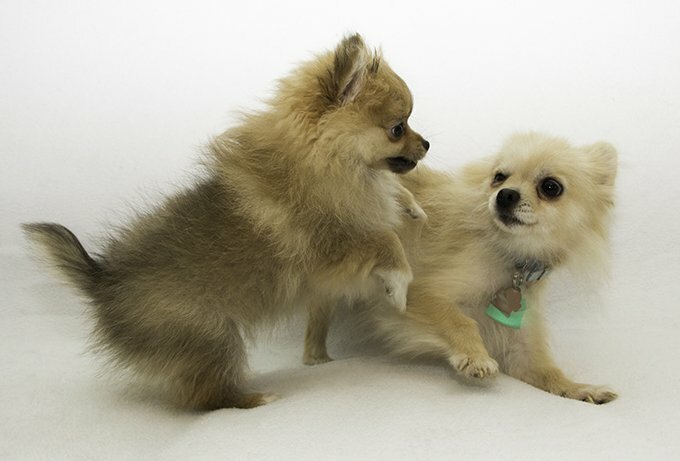 Do you have advice for someone who adopts a Pom puppy? Let us know in the comments below!